Following the Armistice on November 11, 1918, the 26th Division was in such bad shape that rather than join the Army of Occupation which entered Germany it was returned to the rear. 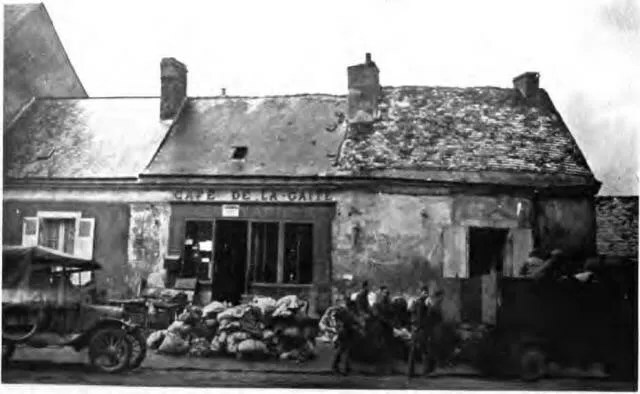 On the march, it passed through the area between Gondrecourt and Neufchateau, stopping on November 23 at Montigny-le-Roi (Point A) where Division HQ was established. The 103rd Regimental HQ was located at Chauffort. As the Armistice was not a formal peace treaty, the men continued to maintain their training although leaves were now permitted (the Armistice originally ran for 30 days and was regularly renewed until the final signing of the Treaty of Versailles in June, 1919. In the interim, the Germans were on notice that any deviation from the terms of the Armistice would cause a resumption of hostilities within 48 hours). Military censorship of the mail was lifted, enabling the troops to more clearly reveal the nature of their whereabouts and activities. 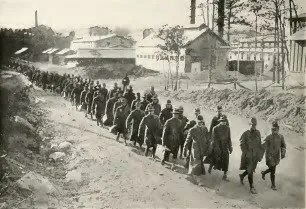 Prisoners were returned by both sides in early December. 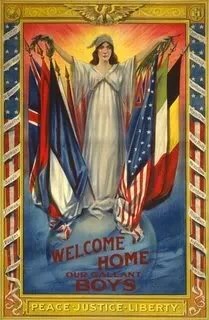 At Christmas, the 26th Division was honored both as the Division with whom President Woodrow Wilson shared Christmas dinner, and that which furnished the Presidential Honor Guard at AEF General Headquarters in Chaumont. 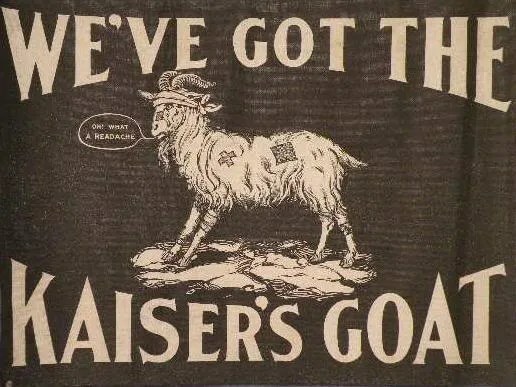 On January 8, 1919 orders were received for the 26th Division to begin preparations for return to the United States. Movement orders were received on January 17, but the day prior to the 103rd Infantry’s scheduled departure their commander Col. Percy W. Arnold was tragically killed in an accident. After burying their Colonel with full military honors and much sadness, by January 21 the troops were marching to the trains which carried them to the embarkation area near Le Mans (Point B). Division HQ was opened at Ecommoy on February 4 with the 103rd Regimental HQ located at Laigne. Two events of note during this period included the Division review by General John J. Pershing and the Division Athletic and Military Tournament. The Division review mustered over 25,000 men on a single field where they were inspected and then passed in review before Gen. Pershing with fixed bayonets, helmets and light packs. 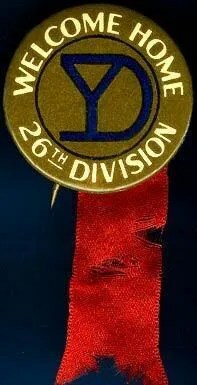 The Division Tournament was held at Ecommoy in mid-March and lasted for three days, consisting of competitive military and athletic contests with the 103rd Infantry winning second place. At this point the men with good conduct records were granted generous 10-day leaves to sight-see around France and even London. Post schools were also established to further the education of the troops in reading, writing, mathematics and history. Selected officers and men possessing at least a high-school education also had the opportunity to attend classes at the AEF “University” in Beaune. 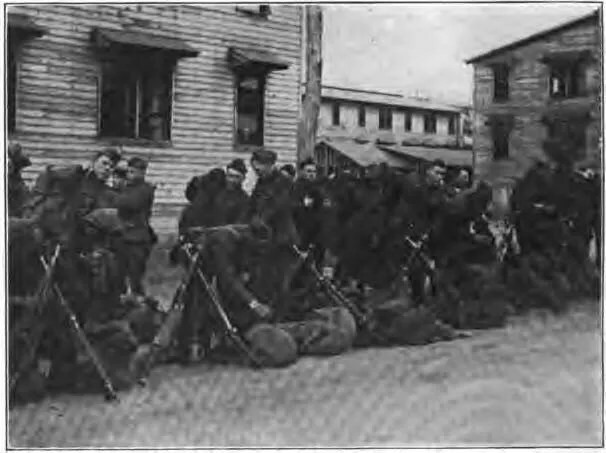 In late March the 26th Division proceeded to Camp Pontanezen at Brest (Point C), where the men boarded troop transports and finally sailed for home. 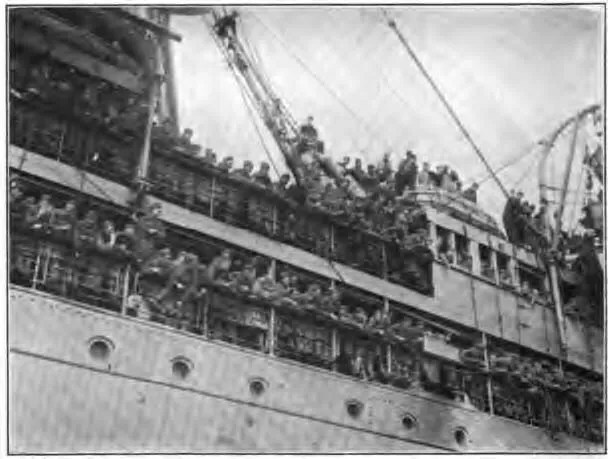 On March 28, 1919 Private First Class Sam Avery made passage from Brest, France back to the United States with 7,200 other officers and men of the 101st and 103rd Regiments aboard the U.S. Navy’s troop transport USS America (ID-3006), returning to Boston on April 6 after a speedy 9-day voyage without the threat of U-boats. ORIGINAL FILM OF AMERICAN TROOPS SAILING FROM BREST FOR HOME, 1919. After arriving in Boston, Sam traveled 3 hours by train to Camp Devens in Ayer, Mass. where he was billeted with the rest of the 26th Division pending discharge from service. 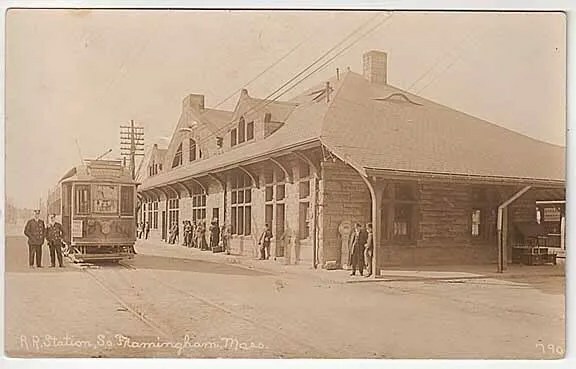 The train ride from the Boston pier to Camp Devens traveled the New Haven & Hartford line to Concord where it then followed the Boston & Maine line to Ayer. Along the way, Sam could see the street in Framingham down which he had marched with the 8th Mass. 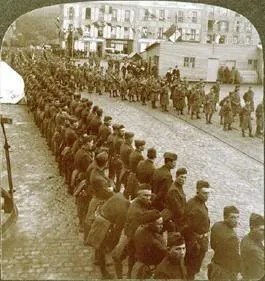 Infantry in June, 1916 to entrain for the Mexican Border. At every station along the route, crowds of well-wishers welcomed the doughboys home with cheers, flags, bands and baked treats. 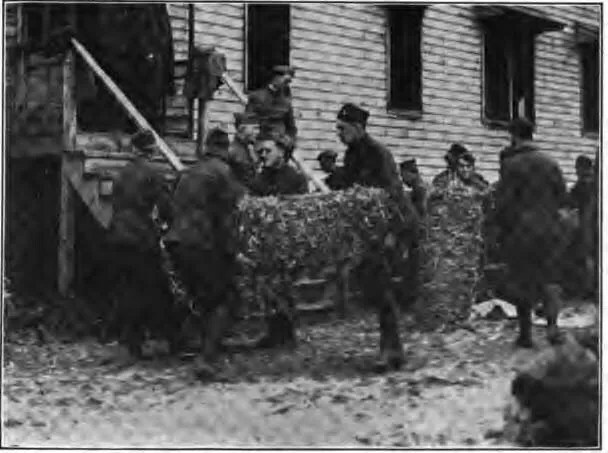 Following a Division Review by the New England Governors at Camp Devens on April 22 and a grand Divisional Parade in Boston on April 25, the officers and men of the 26th Division received their discharges on April 28-30, 1919. Along with their discharge certificates, Sam and all other members of the 26th Division honorably discharged from service received a Discharge Bonus of $60.00 per man regardless of rank. Each soldier was issued three scarlet Discharge Chevrons to be worn midway between the elbow and shoulder on the left sleeve of the overcoat, service coat and olive drab uniform shirt which distinguished the honorably discharged status of the wearer (it was unlawful under the National Defense Act for discharged troops to wear the uniform without this distinctive mark). 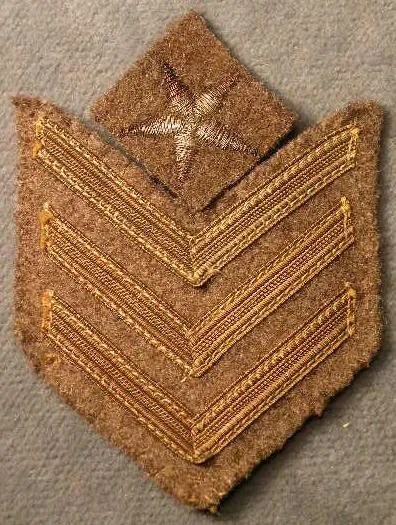 Sam also displayed three gold War Service Chevrons above the left sleeve cuff representing 18 months of overseas service (1 for every 6 months Over There). 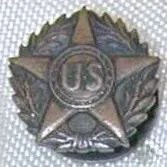 Those who had served among the original 100,000 volunteer troops who were first deployed with the AEF (both Regular Army and National Guard) could also display a “Sammy Star” over their Service Chevrons to indicate they had been the “first in the fight” rather than having been drafted into service. Railroad tickets were provided to discharged soldiers at a reduced rate of $.02 per mile from the place of discharge to their homes. 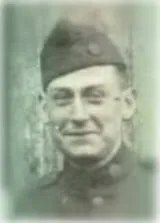 A Travel Allowance of $.05 per mile was also paid from the place of discharge to the place of original enlistment or induction, which for Sam was from Camp Devens in Ayer back to Somerville, Mass. Read Soldier’s Mail after the Armistice here: December, 1918; January, 1919; February, 1919; March, 1919.